The garden’s getting drenched with rain today, thankfully, so I stayed inside and made soup. 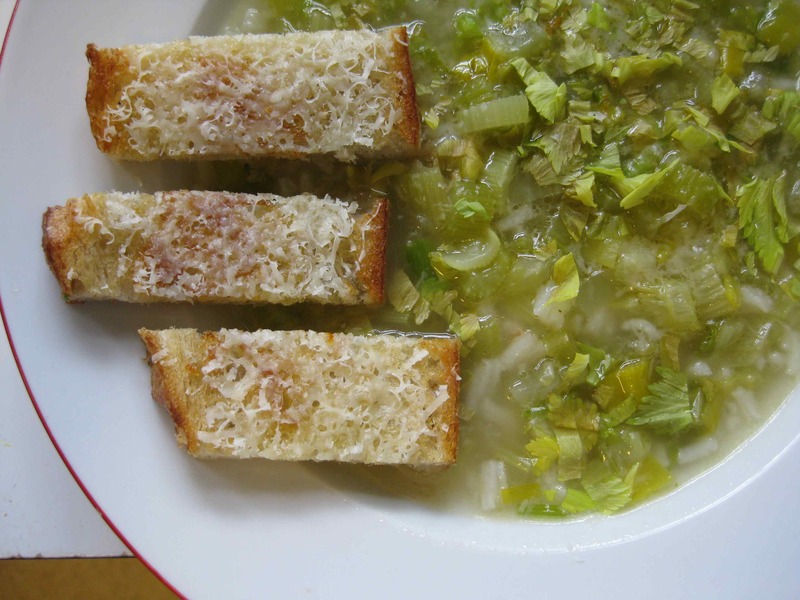 Lovely celery and leek soup feels spring-like, light and nourishing just like the rain. Local leeks were back in this morning’s farmers’ market so I wanted to build a soup around them. I also had an abundance of organic celery with lots of leaves, a perfect pairing with the leeks, united by homemade chicken stock from last weekend’s roast. And then there was the secret ingredient: a hunk of rind from Parmesan cheese. When the cheese is mostly grated off and the rinds start to harden, I just tuck them away in a plastic bag in the refrigerator and add them to soup. They impart a rich flavor to the soup base and I know I’ve wrung the most flavor from a fairly expensive ingredient. Slowly saute the celery and leek in butter until the leek start to soften. Add the chicken stock and cheese rind and bring to a boil. Lower the heat and simmer for about 10 minutes. Add the raw rice and cook for another 15-20 minutes until the rice is tender, adding additional liquid (water or stock) if the soup gets too thick. Adjust for salt and add chopped celery leaves, reserving a few for the final garnish. Serve hot, sprinkled with Parmesan cheese and additional chopped celery leaves. Parmesan cheese toasts are a nice accompaniment.